Blowout Sale! Free Shipping Included! 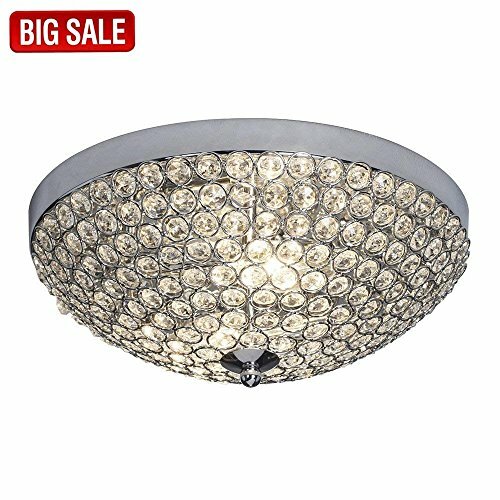 Save 73% on the SOTTAE Fashionable 2 Lights Bowl Shaped Crystal Mental Shade Chrome Finish Bedroom Living Room Hallway Kids Room Modern Crystal Chandelier Ceiling Light, Ceiling Chandelier Size 11.8''(14# Size Bead) by SOTTAE at F LED Lights. MPN: CLYTST0027-NEW. Hurry! Limited time offer. Offer valid only while supplies last. SOTTAE Crystal Chandeliers High quality fashion designed crystal chandelier, get the most value for your money with SOTTAE crystal chandelier! High quality fashion designed crystal chandelier, get the most value for your money with SOTTAE crystal chandelier! Suggested Room Fit: Hallway, Bedroom Living Room Baby Room, Sleepping, Corridor, creating romantic and warm atmosphere. We are your best choices! Size( Diameter, Height): Diameter：11.8", Height:4.72". 1. Use E12 base bulb. Can be used with CFL or LED Medium base bulbs. 2. Use the chandelier as a gentle nightlight, it can creating a romantic atmosphere. 3. Easy to install. Please put on the gloves to install the lamp. If you have any question, please feel free contact us. This chandelier need Self-assembly. Includes Hardware and Instruction. Easy to install. Crystal Chandeliers ideal for Kithchen, Hallway, Passway, Living Room, Bedroom, Bar, Aisle Hotel, Restaurant and more. If you have any questions about this product by SOTTAE, contact us by completing and submitting the form below. If you are looking for a specif part number, please include it with your message.